Online voter registration has gotten a lot of attention over the last year or so. The endorsement of the PCEA reflects a growing bipartisan consensus in most states that it is a worthy reform, but a new report suggests that OVR sites have a long way to go until they are accessible to people with disabilities. 1. It is a good idea: People with disabilities constitute 19 percent of eligible voters. Those most likely to experience barriers online are people with visual disabilities, cognitive disabilities (such as traumatic brain injury), learning disabilities, and limited mobility of arms and hands. For many, online registration would remove the need for a time-consuming and burdensome trip to the Department of Motor Vehicles. • It allows people with visual disabilities to use screen readers, which translate the text and navigation features on the website to speech. • It allows people with limited hand or arm mobility to navigate the site without having to use a mouse, but through the use of a keyboard or voice commands. • It provides people with hearing disabilities, or certain processing disabilities, with a written version of auditory content. 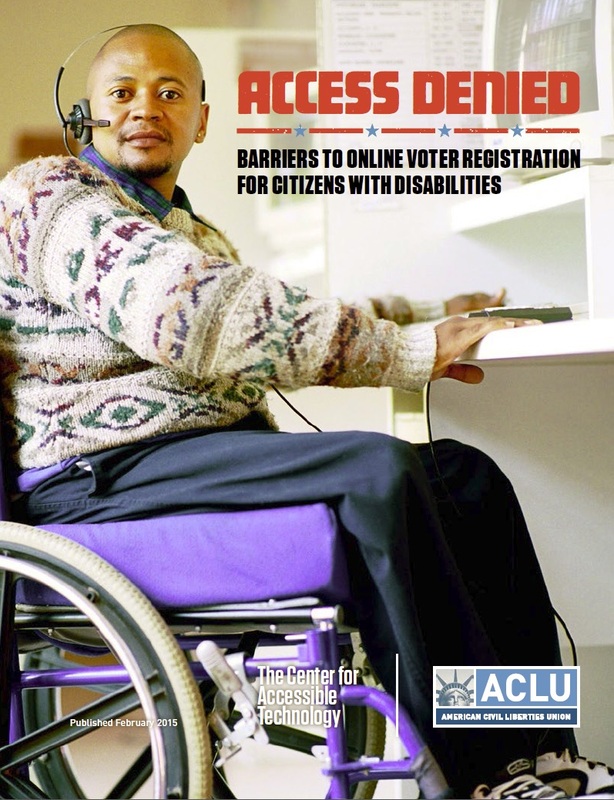 The bad news: Only one online voter registration site in the country– California’s–is fully accessible to people with disabilities, and most state sites do not meet even minimal standards of accessibility. The good news: The changes needed to make most voter registration websites accessible are both inexpensive and relatively straightforward. Furthermore, the steps needed to make websites accessible to people with disabilities tend to improve the user experience for everyone. On all but one of the state sites reviewed, the most important portion of the website–the online voter registration form itself–was inaccessible to people who use screen readers. (Screen readers are a simple technology that translates text to speech for people with visual disabilities, dyslexia, or other cognitive disabilities.) Because the forms were not properly coded, people who use screen readers would find it difficult or even impossible to know if information such as their name or address was entered into the proper fields. All but the California and Utah websites were structured in a way that makes it burdensome and confusing to navigate with a screen reader. Proper coding allows a user to move between screens without getting lost or confused in the process. People who are blind or low vision cannot view an image on a site. They rely on coding (called alternative text, or “alt text”) that explains what an image is. The majority of sites either did not provide this information or provided it incorrectly. Some states designed their sites in ways that created obstacles for both users with and without disabilities. These design flaws include using insufficient contrast between text and background color, using small text that fails to enlarge clearly, and using sophisticated and complicated language where simple sentences would do. The report goes on to provide a report card on state OVR sites and provides very specific guidance – in many cases, including HTML code – to solve the problems. This is a fantastic resource, both for states that already have OVR as well as those preparing to enact and implement it. As technology claims more and more of the voting process, it’s important to remember that accessibility for people with disabilities doesn’t just involve removing physical obstacles but also barriers to effective access to online resources. Huge thanks to the ACLU and the Center for sharing this resource! Be the first to comment on "Access Denied: New ACLU/Center for Accessible Technology Report Rates State OVR Sites"